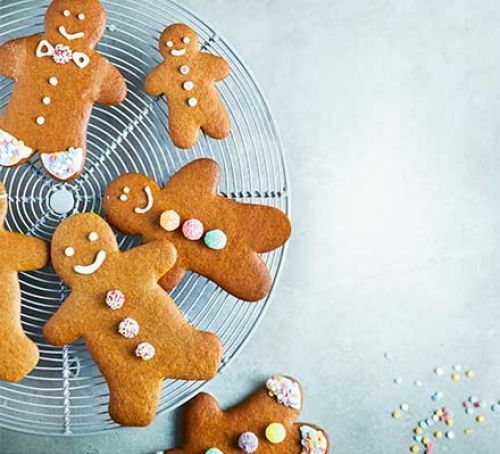 Make your own gingerbread men, women and children with this easy recipe! It’s a festive favourite. Get creative with decorations – try making your family! Melt the sugar, golden syrup and butter in a pan, then bubble for 1-2 minutes. Leave to cool for around 10 minutes. Mix the remaining ingredients in a large bowl and gently knead until smooth and streak-free. Wrap the dough in cling film and chill for 30 minutes. Remove the dough from the fridge and soften at room temperature. Heat oven to 200°c/180°c fan and line two baking trays with parchment. Roll the dough to the thickness of a £1 coin and use a cutter for the ‘gingerbread person’ shape. Re-roll excess dough and cut again. Bake the biscuits for 1-12 minutes, swapping the trays halfway through. 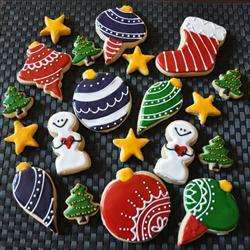 Decorate the biscuits using the icing and sweets! Let dry for 1-2 hours. This classic recipe is simple to make and the perfect base to creating your own icing masterpieces. You can use festive cutters or carefully use a knife to cut out some fun shapes. 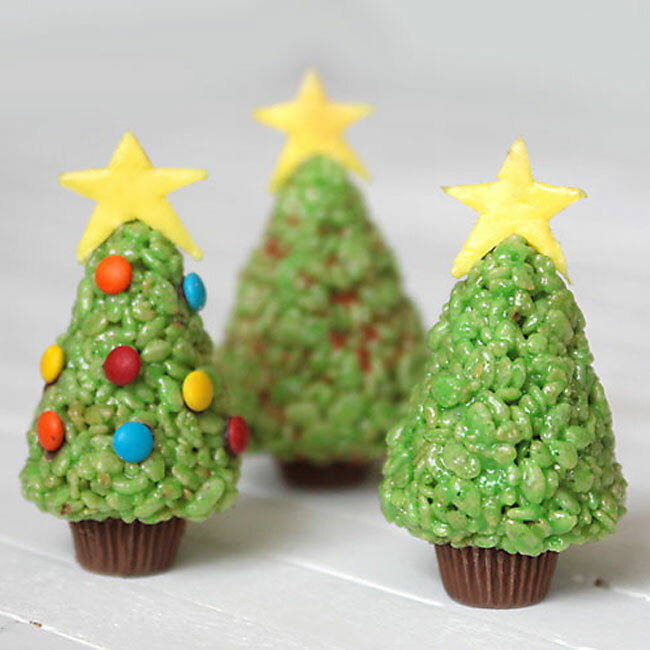 Think baubles, Christmas trees, stars, snowmen… This recipe makes 4 dozen, so experiment! Gradually mix in the sifted flour and chill the dough for 2 hours. Use cutters or a knife to create your desired shape. Bake for 6-8 minutes until edges are slightly brown, cool on wire racks. Decorate with icing when completely cool. Let your creativity run free! 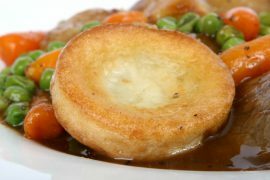 Read the recipe over at All Recipes UK. 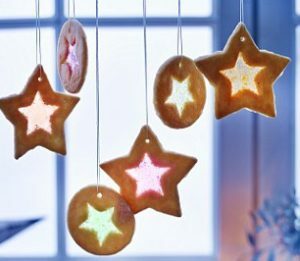 Using the same recipe as above, you can make some beautiful Stained Glass Window Biscuits that also double as decorations! The only extra ingredient is boiled sweets of different colours. Follow the above method, until you have your dough rolled to 5mm. 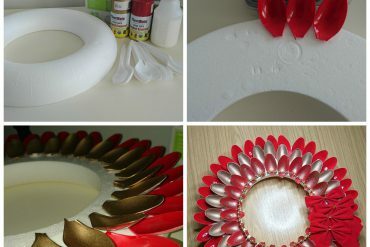 Use a large cutter to create the main shape, with a smaller cutter for the middle, or carefully use a knife. Crush the boiled sweets in separate food bags by colour until they are fine grains. Sprinkle the grains in the middle of each biscuit. Bake until the biscuits are pale gold and the sweets have melted. Leave the biscuits to cool, and use them as tree decorations if you would like! Check out the Mary Berry’s recipe here. Another offering from BBC Good Food. These cakes are so simple to make, yet so effective! They’ll brighten up any Christmas dinner. Melt the butter, milk chocolate, peanut butter and marshmallows on a low heat until the marshmallows are just starting to melt. Pour over the rice pops and raisins, stir until well coated. Line an egg cup with cling film and press a tablespoon of mixture firmly inside. Remove the mixture and place the ball in a cake case, flat-side down. Repeat with the remaining mixture and chill until firm. Melt the white chocolate (either in the microwave or over a pan) and spoon over the top of each pudding. Place the holly leaves on top for decoration. Everyone loves Rice Krispie treats, so here’s another festive treat! Melt the marshmallows, golden syrup and food colouring together. For a star you can use chocolate, icing or a flattened Starburst! A truffle you can make in the microwave? A truffle you can make in the microwave! This super easy recipe is quick, fuss-free and delicious! Put the cream and dark chocolate in a microwave safe bowl for 30 second bursts until melted, stirring in between. Remove once fully melted and stir until smooth. Cover with clingfilm and cool in the fridge for 2-3 hours until firm. Using a teaspoon, scoop out the mixture and roll into balls on the tray. 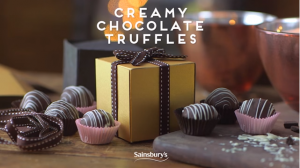 Using a fork, dip and coat the truffles in the melted chocolate and set in the fridge. Once set, melt the white chocolate and drizzle over the set truffles. So there you have it! I’m hungry just looking at these! Which one will you be trying? 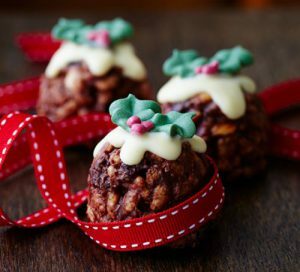 What’s your go-to Christmas recipe? Let us know in the comments! 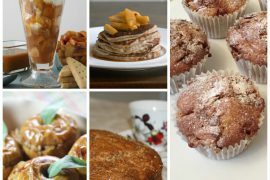 Don’t forget to show us your bakes!